Some reasons for cleaning your throw pillows are extremely obvious, such as: they are covered in spots, the dogs lay on them, they smell bad, the baby drools on them, etc, etc. However, there are also some less obvious reasons. Through everyday exposure to air and life on earth in general bacteria, mold, dust mites, etc tend to accumulate in our pillows. (I know it’s gross…) This is a much more significant concern for your head pillows (the ones you sleep on every night.) However, it is still a concern for those decorative throw pillows you throw on your bed, couch or anywhere else, especially if your throw pillows get heavy use. Your throw pillows are probably getting heavy use if: you throw parties, have kids, or spend a lot of time on the couch in general. 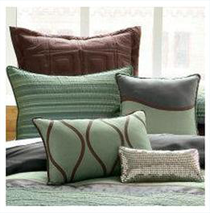 As a result your throw pillows have plenty of opportunity to collect dust, mold, and general grime. The more people that handle your pillows then the more bacteria, etc they can collect. If your throw pillows sit on the couch in the family or sitting room and are seldom used then you don’t need to wash the pillows very often. However, if the pillows are in a high traffic area you should was them much more frequently. As with clothes, different fabrics handle washing in different ways. If you have a more delicate material then chances are it won’t handle washing as well. Keep pillows like these out of high traffic areas, to avoid the necessity of frequent washing. In addition, some fabrics are very tough and let little in, such as the fabric used on outdoor cushions. Some outdoor cushions need to be cleaned as infrequently as 2-3 years. Every so often you may spill something on your pillows, or in some other way expose it to dirt, or other impurities. In these cases a full washing may be necessary as soon as possible. A complete washing isn’t always necessary however, sometimes a spot clean will be sufficient. If you rarely use the throw pillows then 1-2 times yearly should be plenty to keep your throw pillows clear of dust, germs and dust mites. If your throw pillows are exposed to a lot of action then once a month may be necessary. High traffic pillows should be washed a minimum of once every two or three months. That way sweat, grime, dust mites, oils, etc don’t build up. If you have throw pillows on the guest room bed and frequent guests then it is a good idea to wash these pillows monthly or at the very least seasonally. Beneficial data here, This is what i’m in search of. thanks, i have bookmark your website.